As the population in India grows the problem of employment also increase because there are limited jobs and also need quality education. Global economic instability also increases unemployment. These are the reason due to which now’s a day people with different age group and experiences apply for one job and companies have more option to choose than before but it also raise the question how to compete with younger job applicants? Generally more qualified people apply for the job they are overqualified for and then they have to compete with qualified candidates. Sometimes it happens due to personal reasons and other time due to professional reasons but whatever the reason is a person need to be well prepared if he/she wants to compete with younger candidates who may be more suitable for the job then experienced one and experienced candidate generally cost more to a company then younger one so be prepared. Globalization causes major stir in terms of job, so many people choosing a different area of work than the area they are expertise in. opportunity from all over the world present itself on your door step and candidates from different age group working for a single profile so it cause a competition between elder and younger candidates. Economic instability force elder people to choose a job for which they are overqualified. Sometimes it happens out of interest and sometimes due to financial reason. But all in all,there is competition between age groups for common job. In older times people tends to stick to one job throughout the life but this trend is changing with great speed and people are less hesitate while choosing work from other areas and openly accepting the challenge it gives them and the thrill. It happens quite often that people choose work they love the work they currently doing. Open mindset also helps experienced people to choose a job from different areas and expertise. Experiment or problem motivates them to choose the different stream of work. Experienced employee easily work under younger ones because the level of education makes the difference between their post and people accept these changes,on the other hand it increase competition to the new level. Number of people increasing at a fast pace than number of jobs and this create instability in jobs and working criteria. People choose job less relevant to them or the job they overqualified for. they still choose to do the job because they have no other option. While there are people struggling with younger applicants to get the job they have to prepare well and work little hard to get the job. There are few things which can help and prepare them for the challenge. How to Distinguish Yourself from the Market? Resume for any job play very important role for a candidate. It’s a window between employee and employer. Candidates judged on the basis of their resume so prepare resume carefully and provide accurate information as well as a brief description and keep things less complicated. Interesting resume always catches attention so be little more creative while drafting a resume. Highlight your skills and demonstrate your experience. Experience can play an important role in getting the job but it always depends on how effectively you can use it for your benefit. Demonstrate your experience; use your skills to impress and make it your plus point rather than you are negative. Your experience can be your personal advocate if and only you use your skills in right manners and helps you in more way than you can imagine. Your attitude can be your worst enemy so works on your attitude before you apply for the job. A Negative attitude is like a plague; can harm you in you in more ways then you imagine on the other hand Positive attitude always bring positivism in your life. It can help you in achieving right job. Positive attitude also shows that you are ready to take on the world head first. Good communication skills always come handy when trying to get a job. Good communication skills in the workplace or out of workplace will help you in getting the job as well as maintain a job. Most of the jobs require good communication skills because of the globalization. Communication skills show your strength as well as weakness so use communication skills for your benefit rather than as your negative point. These steps help you in preparing for the competition and motivate you to achieve the goal. Competition is everywhere; each step you took you will face competition. So many candidates are applying for one job and you are easily replaceable by younger and better candidate. 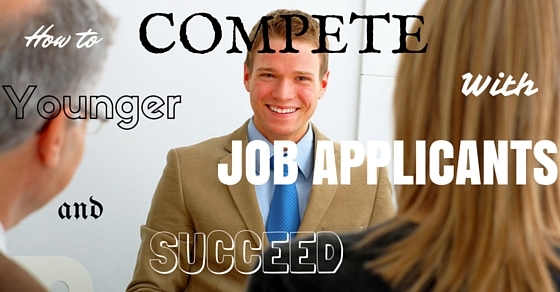 While competeting with a younger candidates there are few things a candidate must do before the interview. Your previous job and contact you make there can help you in getting the current job. Use contacts to help you, to promote you and for references as well. Your contacts can recommend you for the job and gives you important suggestions and advice so use your contact and get in touch with your previous colleagues, friends, acquaintances and get the update on market and industries for better jobs. New technology comes and goes but to get the job and compete with younger candidates you must well aware of new technologies and update your skills according to the current requirement. Learning new technology and getting updates on latest trends always help in securing the job. Get the idea how things work in a new environment and what are the latest feature in the market as well as latest job openings. Be ready to adapt new changes fast and learn. Use your confidence and experience as a tool to show that you are ready to take on new challenges and will adapt younger corporate environment. Adaptability helps you in learning and makes it easier to accept changes. It always works in your favor if you are ready to adapt and learn from your younger ones. Do not let your ego gets the best of you. Maintain flexibility while discussing salary, benefit and services. You are more experienced but competing for the job you are overqualified so be a little more flexible in term of salary and benefits. It happens that salary may not match your expectation or incentives are not as according to the work so discuss the possibilities openly but maintain flexibility. Experience person over non experience one have an advantage of their knowledge. Experienced candidate can easily highlight skills which can be used in more than one job like writing and motivational skills. Flaunt your knowledge as it makes you more appropriate for the job but do not overdo. Skills you learn while working always help you in securing another job because today’s time demand you’re best at all the time. Punctuality always helps you in scoring the positive point while searching for a job. people who respect time always consider the better candidate to choose and every organization want their candidate who respect time because time is money in this globalization where delay or lack of response may cost you the post you are working hard for. So be punctual and respect time. Keeps these few thing in mind while you are seeking for the job you are overqualified. Competition with younger one is a risk you have to take to get the job. While competing with younger candidate there are few things you should never do otherwise they can cost you your job or can harm you in the long run. Overconfidence can easily jeopardize your job. Experienced candidate generally thought they are better than younger candidate because they have more working experience and knowledge but the reality do not work like you think. There is younger candidate who can do better than you in less amount and time so keep your confidence level in check. Ego in experienced candidate makes them blind and they make grave mistake by thinking that they are the best or they are non replaceable but there is no truth behind these assumptions and there are candidates out there who can work better than you. Do talk with other candidate and always keep in your mind that there are so many candidates ready to take your place. You are easily replaceable. Do not underestimate yourself. Self loathing and lack in confidence make you unsuitable for the job. Be confident and fight for your place with dedication and determination. Negativity in your behavior shrinks your chances of getting a job never underestimate yourself. Avoid these things to get the job because no one want incompetent employee and they wants your best all the time. There are few Dos and Don’ts one should follow while compete with younger job applicants as younger candidates have more caliber to work long hour and for a long period of time, on the other hand CTC for a younger candidate is less than for experienced one that makes the competition tough so follow these Dos and Don’ts. 1. Keep your attitude positive: as it will keep you positive and give you better mind set and help in preparing for the job. 2. Adapt new technology: technology is the important part of our life so be updated on latest technology and trends. 3. Be more techno savvy: use computer equipment and gadgets helps you in landing more jobs than you think. 4. Improve communication: improve your communication skills as they are as important as knowledge of computer in present time. 5. Productivity: be more productive and innovative in your work. 6. Punctuality: it is one of the important things should always keep in mind that be punctual and always be on time. 1. Overconfidence: it works like poison for you so avoid overconfidence. 2. Underestimate: never underestimate yourself as there is no age to do any work. 3. Late response: never be late in your response as it will leave a negative remark on your profile. 4. False information: never lie about your work and experience as it may cost you your job and bad publicity. 5. Capability: do not apply for the job you are not capable for as it will decrease your productivity and result in the lack of interest in the job. In the age of globalization where differences between age do not matter and people from different age group choose to work on low profile job or the jobs they are overqualified for but it never stop people from applying for the job. Another reason of such action is instability of the global economy and increasing population which result in current situation. To compete with younger generation experienced candidates need to work on improving different area and adapting new skills so that they can secure the job they are looking for. Learning new things, use of technology, great communication skills and flexibility with a positive attitude can help in achieving such goal and getting the job they want. Always keep in mind that it doesn’t matter you have more experience because there are people ready to do the job at a lower price than you and for long hours as well and can serve the company for more years than you.